The brandy itself is distilled from Colombar grapes, in a 400 litre copper potstill, donated by the South African Brandy Foundation in 1991. Each year, the brandy is carefully distilled by final year students, under the watchful eye of Lorraine Geldenhuys, and matured in 300-340 litre oak barrels. 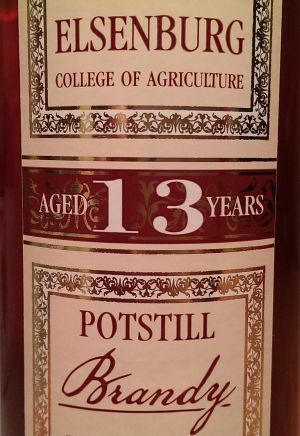 The current release is labeled a 13 year old, just purely based on fun, the fact that the 13 year old was ready to make the base of a blend, and that it was released in 2013. Leave it to the educators and students to break the rigid mold of 10, 12, 15 and 20! And why not, if it’s ready to drink, let’s drink it! There are components in the blend of up to 17 years old, but as the youngest is 13, that’s the age stamp, by law, it must get. So what does it taste like? According to Lorraine, because of its age and maturation profile, the brandy is fruity with complexity, vanilla, cinnamon, peach and apricot. Its term in older oak barrels, gives rise to the classic oak wood aromas of chocolate, nuts and spices. And I’m inclined to agree with most of that! Read my full review of the Elsenberg 13 year old brandy, in the tasting room. Elsenburg: Will you ever taste it? It all sounds too good to be true, doesn’t it? Well, it is – actually. You see, unfortunately it’s not for sale. Even though 985 (500 ml) bottles of this marvelous elixir were produced, they will all go towards educational and promotional use within the department of agriculture…lucky them! But I ‘ll let you in on a little secret. Elsenburg will be at Fine Brandy Fusion in both Cape Town and Johannesburg. And they will be tasting a limited 6 bottles of the Elsenburg 13 year old at both. So if you fancy trying a seriously good quality micro produced potstill, get there early and head straight for Elsenburg. Lorraine will be more than happy to share a taster with you. Be quick though, 3 litres wont last long! Trust me, it will be worth it.